Brothers and sisters, salaam alaikum. In the Jewish tradition, when we comfort, we come first in silence. “מצטרף בצערך, I join in your sorrow.” And so, I will speak, but really all of us are here just to be alongside you. Because you’ve been alongside us, because we’ve stood together as communities time and again, because, candidly, we’ve become too good at this. We’ve become too good at being with each other in this city, in Boston. When we have mourned and suffered we’ve known that we have not mourned and suffered alone. I want you to know that you do not suffer alone. My teacher, Shaykh Yasir, has spoken so eloquently today of the teachings of the Abrahamic faiths, of the understanding of prophets that go all the way back to Adam. And as my teacher Shaykh Yasir has reminded me, there is so much that is shared within our traditions. The Koran teaches us in Surah 5:32, that if anyone killed a person, that it would be “as if he killed all mankind, and if anyone saved a life, it would be as if he saved the life of all mankind.” That same spirit, that same tradition, is part of the Jewish tradition and the Jewish understanding of the way in which we walk in the world together. Our Mishnah, our holy text, tells us that God cried out to Cain when Cain killed his brother, and said: “The bloods of your brother scream out!” And our Rabbis explore that and say anyone who destroys a life, and I’m quoting from our text, is considered by Scripture to have destroyed an entire world; and anyone who saves a life is as if he saved an entire world. My brothers and sisters in Boston’s Muslim community, we stand with you because we understand. This terrorist and white supremacy are a sin against our traditions. They are a rejection of the teaching of God—that none of our ancestors are greater than any others. We stand with you to reject terrorism. There is no good on that side. There is no good to be found in those who march in praise of white supremacy and white nationalism. They are a threat to all of us. They are not the other side. There is only one side: It is the way of walking with God and understanding God as we each come to God in our own traditions. In the Jewish tradition, when we hear of a death, we say, “May their memory be for a blessing,” and when we visit a house of mourning, before we leave, we say, “May you be comforted amongst the mourners.” Today I leave you with this: Today on this day, there are far too many blessings in this world, and there are more mourners than you can imagine. Salaam alaikum. This morning we awoke to the heartbreaking news of a terror attack on Israelis. The attack took place in Har Adar, a Jewish community northwest of Jerusalem when a terrorist opened fire on a group of Israeli security officers as they were opening the settlement entrance to Palestinian workers. 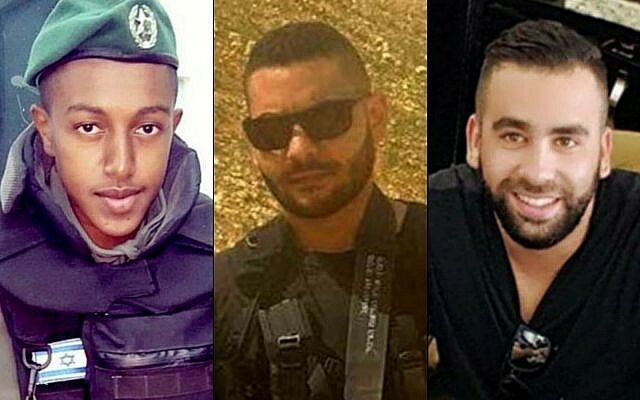 The three murdered Israelis are border policeman Solomon Gavriyah, age 20, from Be'er Yaakov, Youssef Ottman, age 25, from Abu Ghosh and Or Arish, age 25, a resident of Har Adar. A fourth man was seriously injured in the attack and underwent surgery at the Hadassah Hospital Ein Kerem in Jerusalem. Sgt. Solomon Gaviriya, Youssef Ottman, and Or Arish. Our hearts go out to the bereaved families of the victims, and we pray for a full and speedy recovery of the wounded. In these Days of Awe between Rosh Hashanah and Yom Kippur, we pray for peace and security for our brothers and sisters in Israel. May all of us be inscribed and sealed in the Book of Life. CJP, JCRC and Boston’s Jewish community were horrified to learn of a series of attacks against Israelis yesterday. In a single day of violence, 15 people were attacked by Palestinian terrorists. This brings the number of casualties to well over 200 Israelis as well as Americans, Russians and others since September; 34 have died. Yesterday's attacks were in three locations throughout Israel – in Jerusalem, where a Palestinian attacker shot two border policemen; in Petah Tikvah, where an Israeli was stabbed but managed to remove the knife and fight off his attacker; and in Tel Aviv/Jaffa, where a Palestinian man went on a rampage that killed one and wounded 12 others. Taylor Force, a 29-year-old graduate student at Vanderbilt University and a U.S. Army veteran, died from his wounds. His wife was severely injured in the attack. Fifteen others are hurt in the series of attacks, some seriously. The victims, as has been the pattern for nearly six months, were chosen seemingly at random - a pregnant woman, young people walking along Tel Aviv’s beachfront promenade, a man on a suburban sidewalk. We share his affirmation. Attacking people on the street, stabbing a pregnant woman with a knife, shooting random Israelis in uniform, is not a "natural reaction" to disagreement. They are acts of barbarism that violate the very essence of humanity. We call for an immediate end to Palestinian terror and incitement, particularly on social media, which has inspired so much hatred and bloodshed. As we pray for peace and a two state solution, we remind the world that Hamas’ terrorist leaders continue to encourage, even reward murderous acts, and the Palestinian Authority continues to ignore, and even, at times support violent incitement in the media, schools and websites. Peace will only come when Palestinians recognize Israel's right to exist and teach it to their children and when Israelis – the majority of whom yearn for peace and a resolution to this conflict - and Palestinians commit themselves to a negotiated and enduring agreement. As we pray for the injured and mourn Taylor Force, we also stand with the Israeli people who want peace, even as they confront this wave of violence and terror with courage and fortitude. We reaffirm our support of their desire for peace and a lasting resolution that leads to two states for two peoples, with safety, security and prosperity. The last thirty-six hours have brought an emotional earthquake: two traumas of national significance for Israel and for the Jewish people. 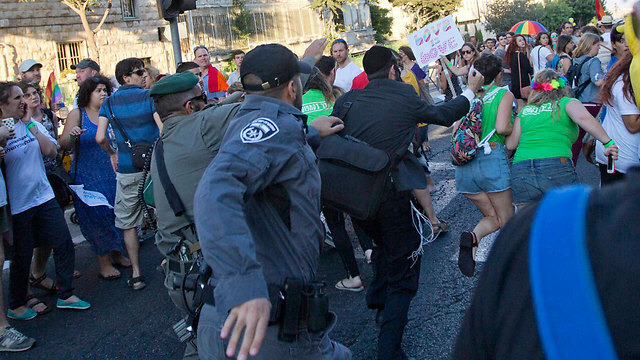 First, the violent hate crime by a Jewish fundamentalist – who was only recently released after serving ten years in prison for an identical crime - at the Jerusalem Pride Parade. Then the horror in Duma, the burning of a Palestinian family and the murder of 18-month old Ali Saad Dawabsha, again, apparently at the hands of Jewish terrorists. Originally I had intended to write to you about how this summer marks the ten year anniversary of Israel’s disengagement from Gaza, and about how Americans engage with Israel and strive to perceive it, including our own Christian clergy study tour who are in Israel this week and happened to be less than 20 feet from the Pride Parade attack (you can see three of the ministers in a photo that AP circulated). I’ve posted those reflections on JewishBoston. I also wrote a more personal op-ed yesterday regarding the Pride Parade, which I hope you’ll take the time to read on Times of Israel. Instead, I’d like to use today’s post to amplify a conversation that many of us are already having about the dilemma of some settlements and of violent Jewish extremism. I’m not offering a statement (beyond todays from CJP and JCRC) or recommending a “new” public position for our community today – to do so in haste and a moment of trauma would be rash and unwise. Additionally, a shift in our public voice on these matters can only be strengthened by careful deliberation and building the broad support of community leaders, like yourselves, to address this in a meaningful way. But we have to have this conversation. The toxic atmosphere that led to the murder of this toddler is not new. Rather, it is an extension of a small but not insignificant movement in Israel that is religious, fundamentalist, extremist, and violent. Some would even say that its’ ideology is supremacist in preferencing Jews and Judaism over other faiths and peoples. Much attention has been given in our community to how moderates in other faith communities need to lead the struggle against their own cancerous extremists. The same obligation falls to us as well. I take heart in the powerful condemnations by Israel’s political leaders today but we need to do more to root out this cancer on the Jewish soul, to face without fear the darkness within us. “The root of our conflict with the Palestinians lies in their refusal to internalize and acknowledge thousands of years of Jewish history in this part of the world, and thus stake out positions, however reluctantly, in favor of a viable compromise to enable our two peoples to live in something approaching tranquility. But the root of our growing international isolation — which is accelerating even as we stand on the West’s front line against Islamic extremism in all its brutal guises — is the apparently untrammeled settlement enterprise. By enabling our soaring ranks of detractors to depict Israel as bent on a relentless West Bank land grab, we are empowering those who wish us ill, and baffling those who want to support us. We make it easy for Palestinian extremists to recruit, and harder for the dwindling proportion of moderates. And we do our own people a disservice. By failing to distinguish between those areas we would seek to retain under any permanent accord and those we would relinquish, and by therefore failing to follow a coherent policy, we mislead the Israelis who live in and move to the settlements, and whose attachment to Biblically and historically resonant land naturally deepens year by year. We waste resources. We exacerbate internal divides. And we entrench our presence in areas that can only complicate any future separation — a separation from millions of Palestinians that is vital if we are to ensure that Israel remain both a majority Jewish state and a democratic one. As we enter Shabbat at the end of this week of trauma, let us find comfort in the notion that the strengths we have found within the Jewish people have always enabled us to overcome and endure, to carry on and see a better day. But let us also consider these dilemmas, our responsibility to face them, and the value and merit of how we speak tenderly to Jerusalem and with joy to Zion as we confront our challenges without fear. We are horrified and heartbroken by yet another act of terrorism in Europe, this time in Copenhagen. This heinous act left two people dead - one at a cafe where a seminar on freedom of expression was taking place and one outside a synagogue where a bat mitzvah was being celebrated - and wounded at least five police officers. We express our condolences to the people of Denmark and our solidarity with the Jewish community who are reeling from yet another anti-Semitic act of terror perpetrated against them. The global Jewish community will continue to stand with our brothers and sisters in Europe and elsewhere who are under attack. We affirm and demand that Jews must have the right to live freely, openly, and safely as Jews. Governments have the responsibility to protect Jewish communities, and all communities, from hate, violence, and attacks on our freedoms. We commend the government of Denmark for doing exactly this last night, providing police protection at the city’s main synagogue. We mourn the death of Dan Uzan, a volunteer security guard and member of the Danish Jewish community; his actions and those of the two injured police officers prevented a potentially much greater loss of life inside the synagogue. Reports at this hour indicate that this act of terrorism may have been inspired by Islamist propaganda. We stand with all decent people in the struggle against this extremist, supremacist ideology that is filled with hatred and backed by violence. We affirm that this is a struggle against Islamist terrorism, not a struggle against the vast numbers of decent people in the global Muslim community. Europe is experiencing a concerted attack on Western values, including freedom of speech, as we saw again yesterday. Those who are attacking the West are also choosing to single out Jews specifically. Anti-Semitism in all its forms is a challenge that needs to be named without equivocation and confronted directly without hesitation. May the memories of Captain Yochai Kalangel, 25, and Sergeant Dor Haim Nini, 20, be for a blessing and may their families find comfort amongst the mourners of Zion and Jerusalem. We are extremely saddened and horrified by today’s terrorist attack on commuters in Tel Aviv. We condemn Hamas' reaction to the attack—branding it "a heroic operation"—the latest example of their commitment to the path of Islamic fundamentalism and terrorism. Those who incite terrorism must be held accountable for their actions. We fully support Israel's right to defend itself against these vicious attacks and responsibly protect her citizens from terror. JCRC’s thoughts and prayers are with today's victims, their families, and all victims of terrorism. Closing Comments from Jeremy Burton at Community Gathering in Support of French Jewry Held Wednesday, January 14th at Temple Beth Elohim in Wellesley, MA. We thank Temple Beth Elohim for welcoming us into their home as we gather to mourn the 17 victims last week and to stand in solidarity with the French Jewish community and all of Europe’s Jews. We have been reminded eloquently tonight that we came here to say #JeSuisJuif, and also #JeSuisAhmed, #JeSuisCharlie. We have been reminded of the impossible choice that the French Jewish community faces, between their liberty and their safety, between staying in their homes and the society that they have lived in and embraced, some for generations and centuries, or just being able to go to the supermarket in safety. We have been reminded of French Prime Minister Manuel Vall’s powerful words this past weekend about the treasured place that France’s Jewish community holds in their nations’ national identity. Scripture wishes to tell [us] that the departure of a righteous person from a place is conspicuous, and makes an impression. Its splendor has turned away; its majesty has turned away; the praise of a city has turned away. The man who wrote those words was Rashi, one of the greatest minds and teachers in Jewish history. And finally, we are reminded of our purpose here, as we stand in solidarity with the Jewish community of France. It is not our role to tell our French brethren what to do. Rather it is our job to let them know they don't stand alone in whatever choices they make. And Ruth said to Naomi, "Do not entreat me to leave you, to return from following you, for wherever you go, I will go, and wherever you lodge, I will lodge; your people shall be my people and your God my God. We are filled with horror as the people of Paris reel from the events of this past week. We are filled with grief for those who were killed by Islamist terrorists in this latest wave of barbarism and anti-Semitism. We join with the global Jewish community, and the people of France, in condemning the attacks and in offering prayers for the seventeen victims and their families. The deadly attack on French satirical magazine Charlie Hebdo underscores the threat that the ideology of the attackers makes to our basic democratic freedoms. Sorely underreported is the fact that the terrorist who on Friday murdered Yoav Hattab, Philippe Braham, Yohan Cohen and Francois-Michel Saada z”tl said that he deliberately “was targeting Jews.” This comes amidst a wave of anti-Semitic violence targeting Jews – especially in Europe - in recent years, a result, in part, of demonization of Israel including by some in positions of authority. In the face of these horrifying acts we stand with the people of France and all decent people in the struggle against an extremist, supremacist ideology that is filled with hatred and backed by violence. At the same time, as we mourn the loss of Police Officer Ahmed Merabet who gave his life at Charlie Hebdo, and as we honor the heroism of Lassana Bathily who saved many lives at the Hyper Cacher market, we affirm that this is a struggle against Islamist terrorism, not a struggle against the vast numbers of decent people in the global Muslim community. We call upon all the people of the Commonwealth of Massachusetts to join us in condemning these barbaric attacks and to make their voices heard in defense of freedom and in rejection of Islamist extremism.